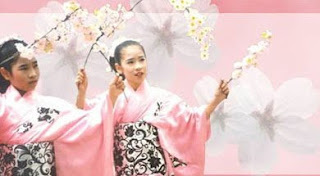 The 2010 Cherry Blossom Festival of Southern California is almost here! It will be taking place in Little Tokyo this April 10th & 11th 2010. As in years past Shinkendo will participate in the martial arts demonstrations with one new additional feature; ME! ほんと です か? はい! That's right! Yours truly, the author of American Mishima himself will be taking part of this years Shinkendo sword demonstration taking place on Sunday April 11th. So please come out and watch our demonstration as well as the many other events that will be taking place this year. We've always had fun at the Sakura Matsuri in Little Tokyo and this year shall be even more fun with me in the mix (I assure you there will be no beheadings accidental or otherwise or acts of seppuku in this demonstration of modern Samurai arts unless of course I make a mistake - なん-ちゃって!) so come out and enjoy the fun and all those かわいい girls in kimono!